West Devon is the area of Dartmoor and around it. Towns and villages such as Newton Abbot, Ashburton, Wiiddecombe in the Moor, Lydford, Okehampton, Princetown and Tavistock spring to mind. There is a brooding feel to the countryside in West Devon around Dartmoor. 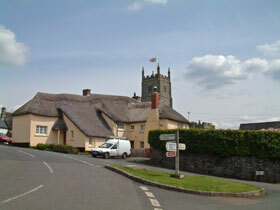 See rolling hill and ancient villages with a church and pub at their centre. Plenty of thatched houses as this one in Drewsteignton. There's a wealth of National Trust properties in Devon to visit, most with absolutely fabulous gardens.